The alarm goes off at 5:20 am. I have pre-packed much of the stuff after switching to sleeping gear last night and thus am on the road with a fresh loaf of bread at 5:55 am (it's cold, for the first time I'm wearing the green spray jacket). Zero wind, so the strategy feels solid. After perhaps half-hour ride I see a sign "Konya 58 k", so something doesn't make sense with some of the distances marked on my map. Somewhere around 8:30 am I see "Konya 20 k."
Konya is big, 720,000 people, and the ride-in from the north must go by every single apartment tower in the city. The road is a wide gentle downhill on super-smooth asphalt and a joy to ride, but I can't help thinking that it's going to be pain to leave, since I'll be heading north again, albeit on a different road, when I leave town. Soon enough I spot signage: "Mevlana Müzesi." Wow - Saved again by Lonely Planet. 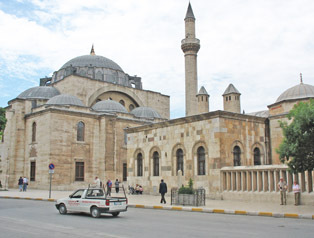 Only because of the guidebook do I know that that's my destination-the cultural center of Konya. A take a bend and a twist, and I pull over to ask directions. The reply, in pantomime, seems to be to go under two things and then to the left. I ride along, go under an overpass, then I see the Mevlana signs pointing into an underpass - a tunnel. I dwell on this for a few moments, and then realize how stupid it would be to go into a busy urban tunnel. I ride along the surface and see those lanes pop-up again quickly. Good! Then after a short run they drop underground again with the Mevlana sign beckoning. Damn. I pass on the invitation. 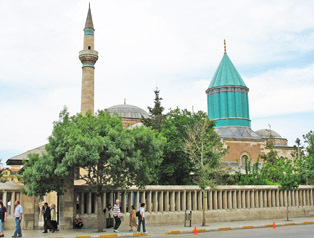 I ride on a few hundred meters, and ask directions to Mevlana Müzesi. I'm told to follow the tram tracks. I do and I ride for a few kilometers. I pass a massive Disney-esque museum, then spot a turquoise tower that's mentioned in Lonely Planet. A few minutes later I'm in the center of everything-with hotels crowded around a busy traffic circle. I pull over to a police kiosk on the edge of the traffic circle to ask directions to the tourist information bureau and perhaps to the Hotel Doria. The policeman invites me to have chai with him and, I decide "Sure" - it's been a great day, I've avoided the wind, I'm at my destination hours before I expected to be… I'm going to go with the flow. I'm surprised to be invited into the actual shelter. It's a miniature shack with a small shelf, a propane water heater and a miniature TV. He squeezes-in a second chair, and we hang out having tea in what feels like a doll house! The guy is the nicest guy in the world, and I hang out for at least 20 minutes. He looks quite a bit like the actor Ralph Fiennes. I learn that he is from Ilgin, did a five-year police stint in Bergama, (his favorite town) and he also did a police stint out east and survived a recoilless rifle attack. He was out getting tea or they fired on the wrong house-it's unclear to me. But it does make the Kurdish problem more real. He tells me that the tourist information bureau is one to two kilometers up the main boulevard and that Hotel Doria is up one block into the right, then right again. I say goodbye and head to the tourist office. I go a kilometer, perhaps a bit less, to where the street intersects a massive traffic circle. Damn! If I ride into that traffic circle, I never my bearings again. I head back down the avenue, frustrated. I take a shot at where Hotel Doria should be and it's right where it belongs. I inspect a room in this clean, business-type establishment, but the room selection doesn't work - it doesn't even seem to have a window in it. I've already asked the management about the location of the tourist information office and am told that its right on the main strip, perhaps 50 meters from where I am. I pass on the room, wander toward the tourist information office, and sure enough there it is! I'm 20 meters from the traffic circle I had tea at earlier. I step into the building; they tell me to go back out and lock the bike. Interesting… I ask about hotels, and they mention Hotel Ulusan -the hotel that Lonely Planet mentions, located somewhere behind the post office. They confirm that there is a hotel and camping a hundred kilometers east of here, on that long straightaway I will be riding in a day or two, and they confirm that there is a hotel at the end of the straightaway as well. Finally, we get to laundry. 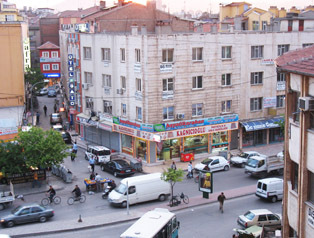 They tell me that Dolphin Laundry is right behind The Atatürk Museum up by the big traffic circle I'd already been to. I bicycle up to the Hotel Ulusan that Lonely Planet referenced. It's clean, but I'm underwhelmed. I visit Hotel Mevlana, drop in and then really underwhelmed - big construction project is taking place. I drop in on the Hotel Bay on my way back and I'm shown a 4th story room with the balcony. They say 40 Turkish Lira. I ask for a deal for two days, I'm offered 80 Turkish Lira. I enter 70 on their calculator, they resist. I enter 79, they laugh, we have a deal and I check in. The laundry project is the day's bummer. 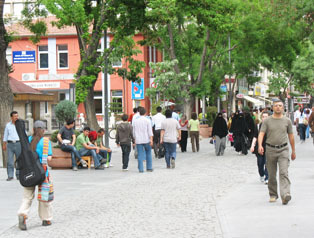 The tourist office said behind the Atatürk Museum. The hotel I am in right now says it's up on the main street, on the right side before the traffic circle. 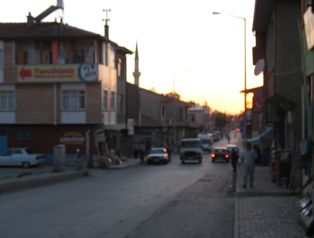 I shoot for the Atatürk location and given directions from there for a hundred or so meters to the next point, from there - another set of directions, from there - another set of directions… I am jumping all around that part of town and failing to find the laundromat. Finally, I find it: turns out to not be that far away distance, but almost invisible nevertheless. Well then risk not finding my clothes ever again, I spend the next two and a half hours within about 200 meter range of the laundromat. It's a nice street up there though. I bicycle back to the hotel, getting my bearings, go back to that neighborhood for the Internet café, kabob and a beer. A dawn escape from Kadinhani. This popular walking street could be in any modern city.